Women of a certain age will never forget the moment in the 1988 Democratic National Convention when then-Texas state treasurer Ann Richards took the stage to proclaim, "Poor George!" She was stumping for Democrats, and mostly she was pointing up the eight years of the not-so-benign neglect of women's issues during the administration of President Ronald Reagan and Vice President George Bush — the new GOP nominee. Ann Richards was a woman whose political prowess was well beyond her time. Would that she had been 41's presidential opponent rather than the ill-cast Michael Dukakis. Would that she were here today to take on Donald Trump. Even in 1988 — three decades ago — she said hello to her enthusiastic audience not only in English, but in Spanish: "Buenas noches mis amigos," she said. The audience applause rose to thunderous approval. She continued, deadpanning: "I'm delighted to be here, because after listening to George Bush all these years, I figured you needed to know what a real Texas accent sounds like." But then she got serious about all the same issues women (and men) are concerned with today: immigration, health care, the national debt, threatened betrayal of the nation's Social Security pact, a confused foreign policy, political lying to the American people, bigotry, misogyny, equality — you get the idea. "And for eight straight years, George Bush hasn't displayed the slightest interest in anything we care about," Richards went on. "And now that he's after a job that he can't get appointed to, he's like Columbus discovering America — he's found child care. He's found education. Poor George. He can't help it. He was born with a silver foot in his mouth." Just imagine what Ann Richards could do with Trump, our newest and current Republican president, who suffers from a disconnect with women and from being born with a silver foot in his mouth. We saw it in last week's State of the Union address. "No one has benefited more from our thriving economy than women, who have filled 58 percent of the newly created jobs last year," Trump claimed with his characteristic swivel and gloat. In the audience, a throng of women in white — the female House members who sat together dressed to stand out and show their power after they swept the midterms in opposition to Trump and to put the House in Democratic control — let those words sink in, then suddenly leapt to their feet and gestured inclusively to themselves and each other, clapping and whooping. Trump was clearly surprised, and not pleasantly so. But mustering a slight smile at the women who had upstaged him, he addressed them: "You weren't supposed to do that!" He went back to the teleprompter: "All Americans can be proud that we have more women in the workforce than ever before," Trump said. The insurgents whooped again, and Trump, seeming finally to get it, asserted some bossiness: "Don't sit yet, you're going to like this." He turned back to the teleprompter: "And exactly one century after the Congress passed the constitutional amendment giving women the right to vote, we also have more women serving in Congress than at any time before." 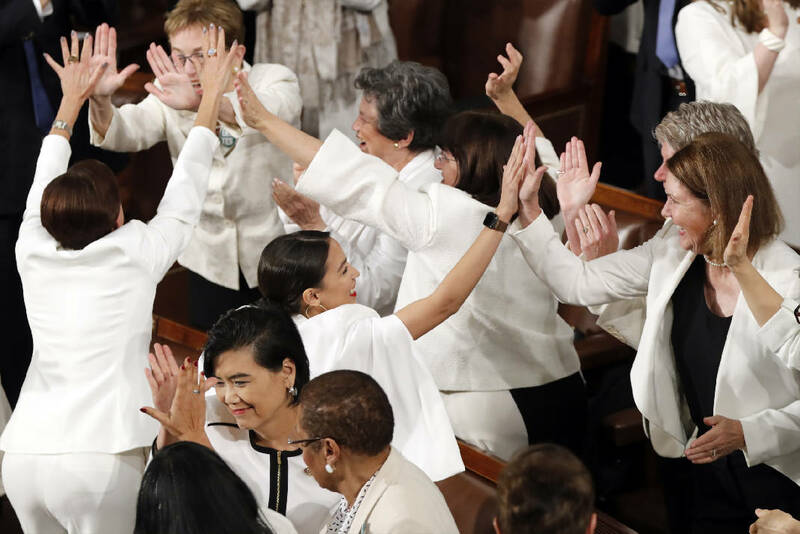 The congressional women lawmakers — by far Democrats — gave each other high-fives, and House Speaker Nancy Pelosi, also wearing white behind Trump, clapped and beamed to the women. Women ran in record numbers in the 2018 midterms; most were inspired to make political bids by Trump's unexpected victory and antagonistic rhetoric and policies toward women. Remember the "grab 'em" tape? A historic number of women won, too — 117 to be exact. They ran and won not because Trump meant to help them, but because Trump is Trump. As for "more women in the workforce than ever" before? As a raw number, this was correct in December before it dropped slightly in January, but that number reflects the increasing size of the U.S. population. The number of overall workers is also at a high — also because of population increase. The more relevant figure — the labor participation rate of women — is not at a record high, according to fact checkers. It stands at 57.5 percent, well below the 60.3 percent reached in April 2000. By the way, that was at the end of Bill Clinton's second term, after Clinton in 1992 made "Poor George" H.W. Bush a one-term president.